1) Oil will NOT rise 60% in calendar year 2008, or 100% peak-to-trough during the year. Remarkably, both of those things occured in 2007. But with global growth on a downward trajectory, demand growth for the gooey black stuff should recede a bit. Importantly, we now know that gas prices of roughly $3.00-$3.25 per gallon represent a "possum point" for the US consumer; i.e., the point at which (s)he rolls over and plays dead. $150 oil at current refining margins would send the USD into recession, thereby eliminating some demand for crude; $150 oil at current gasoline prices would kill the refining industry. 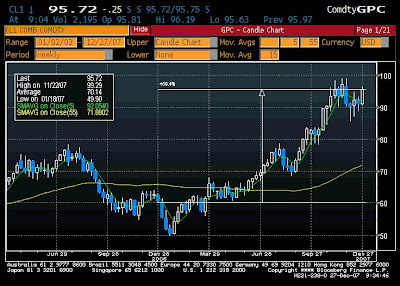 The obvious conclusion is tht $150 oil ain't happening next year. 2) VIX will NOT hit single digits again. Regular readers will be familiar with Macro Man's high-conviction thesis that tightening global liquidity conditions and greater macroeconomic volatility imply greater financial market volatility moving forwards than we've seen in the past. For those who enjoy historical parallels, consider the analogy that 2007 = 1997, wherein there is a brutal localized shock that sends ripples but not catastrophe throughout the rest of the world economy. The follow on is that the aftershocks hit the next year, once growth slows. 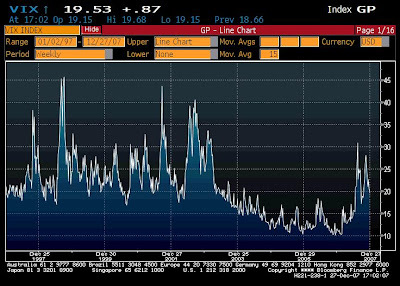 If you see VIX hit low teens or below in 2008, buy all the index options you can. 3) Inflation will NOT die as a macroeconomic issue. It may well be the case that commodity price inflation eases next year, particularly on the energy side. But the inflation story is secular, particularly in emerging markets that for much of this decade have exported deflation, rather than inflation. However, as price expectations in these countries shift and wages adjust, this should produce an upward bias to global goods prices next year. Just as the plankton population dictates the availability of sustenance across the remainder of the global food chain, so too should the inflation dynamic in the low cost producers of the world dictate inflation rates elsewhere. 4) China will NOT step-reval the RMB. The rationale is simple; they'll simply allow a faster pace of appreciation while accruing fewer official foreign currency assets next year. Macro Man has long observed that domestic inflation amongst BWII peggers would be the ultimate death knell of the system, and the recent increase in the pace of the USD/RMB decline (a "whopping" 1.1% decline this month!) suggest that the Mandarins in Beijing have reached the same conclusion. 5) The BOJ will NOT hike rates in 2008. OK, this one's hardly going out on a limb, is it? But given that markets have sort of lazily expected further tightening in the pipeline all year, it's worth pointing out directly. Japan's economic performance in 2007 will have to go down as the biggest disappointment since Waterworld. 7) We will NOT see an honourably fought US presidential election with the outcome determined by the issues. Macro Man was last resident in the United States for a presidential election in 1988, the year that Bush Sr. defeated Michael Dukakis. That election was fought on soundbites and slurs, at least judging by Macro Man's enduring memories of the campaign ("Where was George? ", Willie Horton, and "You're no Jack Kennedy".) From what he can see, it's gone steadily downhill ever since. Macro Man tries very hard to avoid talking US politics both in this space and in real life, given the appalling caliber of the individuals who typically contest major elections. 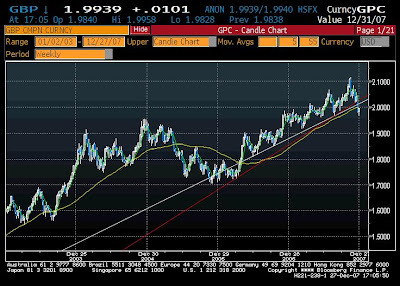 9) Japan's MOF will NOT intervene in currency markets in 2008. Of all the non-predictions on this list, Macro Man is probably least confident of this one. 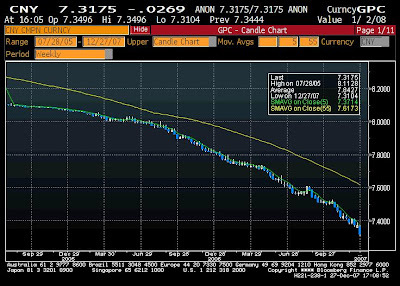 Yet it would truly be remarkable for the yen to experience 22 year trade weighted lows in 2007, and for the MOF to intentionally weaken the currency in 2008. All the more so given the inflated levels of EUR/JPY and, more crucially, the fact that Japan has put her name to G7 statements calling out China for currency piss-taking. 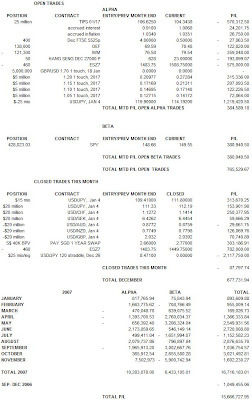 One can only hope that if Macro Man is wrong on this one and the MOF does decide to buy USD/JPY, that both the US and Europe abandon their recent policies of non-intervention and say "200 billion yours, at best" to the market. 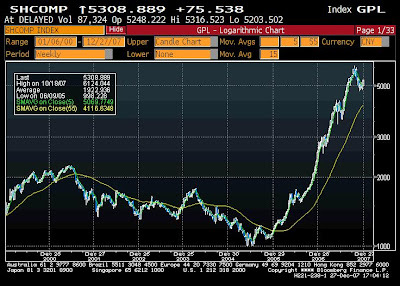 10) The Shanghai Composite will NOT rise another 100% in 2008. Shanghai rose 130% in 2006 and another 100% this year. It ain't happening next year, though. Why? Two reasons. First, the Olympics represent a turning point with regards to sentiment. There are many who believe that the authorities will change their attitude towards rampant speculation after the Olympiad, but are unwilling to do so beforehand in case of domestic unrest. We are likely to see some selling after, during, and prehaps before the Olympics as a result, which could then turn a market rout into a self-fulfilling prophecy. More concretely, the monetary policy stance has already moved to "tight" for the first time in four years; in 2004, the Shanghai Comp shed 15%. 11) Macro Man will NOT find himself in this situation in 2008. Or, despite initial appearances, in any other year, for that matter. Great Video !!! Good Luck in 2008.
the lads in the mask looked like Hang Seng day-traders..
Mostly in agreement, M. But numbers 3 and 8 may end up rubbing up against each other. Of course, your P/L seems to round out to about 16%, so who am I to say? The clothing line is a great idea, BTW. "Ishtar" was the great disappointment, no? How could Dennis Hopper playing himself in Waterworld be a disapppointment ?? C, you're right about Ishtar>, but I am amazed at how few people remember it. great clip. As for the predictions, we already knew would be good/interesting.